Good news Tim Burton junkies, “Dark Shadows” lives up to its hype. For the summer, Burton serves up the gothic soap opera that aired on Television from 1966 to 1971 about a young man who, following a curse, turns into a vampire. A recipe for disaster? You’d think. Instead, “Dark Shadows” is a thriller-diller from start to finish: chilling, monstrously funny and melodically entertaining. And Depp is simply stupendous as our leading man, Barnabas Collins. Poor guy has been locked in a box for over two centuries. When he wakes up, it’s already 1972. Campy some might say. And perhaps it is, but how you react to this wicked premise will have a lot to do with your expectations. I didn’t expect a work of genius, even though I usually expect nothing less than a triumph from Mr. Burton (“Alice in Wonderland” was something of a disappointment). In fact, I approached it with trepidation, worried that Burton’s weird sensibility layered on top of Dan Curtis’ already-surreal material would create a kind of overkill. I’m happy to report that I was pleasantly surprised. What’s more, most of his familiar touches are still here; I for one, was delighted in Helena Bonham Carter’s role as a drunk psychiatrist; she’s wonderfully funny because her performance seems real, not a comedy shtick. Jackie Earle Haley follows her lead, lending genuineness and gravitas to his portrayal of the beleaguered caretaker, Willie (he’s such an underrated actor in my opinion). As for top-billed Johnny Depp, he brings his own brand of lunacy to the role of Barnabas Collins. The first sequence in the movie shows us how, when and why he turned into a vampire. Depp is always interesting to watch, and it’s good to see him back, especially after a series of disappointing roles. In a way, he represents the film’s personality. Because let’s face it: without him, the movie could have been a disaster. But if I had to sum things up in a few words, I would say that “Dark Shadows” has much to recommend it: clever ideas, bright performances (including a surprise cameo appearance by legendary actor Christopher Lee), impressive visual treatment, and an appealing hero. Overall, I enjoyed the film. Do I think it will take its place on my list of best movies of the year? No. It’s strictly a solid piece of escapism, and if you’re expecting a masterpiece, might as well skip it. I think it would be a test for any filmmaker to adapt a classic TV series, and Burton aces it. It’s not “off with his head”. Not yet at least. Thank you! So do we share the same taste? Or do you disagree with me on most reviews? :p and yes the Burton/Depp movies never disappoint! I agree with most of them especially V for Vendetta, 12 angry men, Benjamin Button… (I couldn’t get my mind to remember all the movies I like). But I have to ask, where are Tarantino movies? I couldn’t find them, some other movies I thought about as well. Well I don’t review everything I watch, but I can tell you straight away that I love Tarantino. And you’re right, I should add some of his movies on my blog. You are doing a great huge job, I just asked because I’m a fan of Tarantino. You reviewed so many movies that I haven’t watched (yet) so you are excused :P.
The blog misses you kamen! anyway, I believe that Burton ruined the end of “Dark Shadows”, making something completely cliché (the fight) that could have gained to be a little more sarcastic as he did with the whole movie. It’s a pleasant movie, the actors are, all in all good not to mention those little details only Tim Burton could think of but why a 3/4 ? I agree about it being a “solid piece of escapism”. 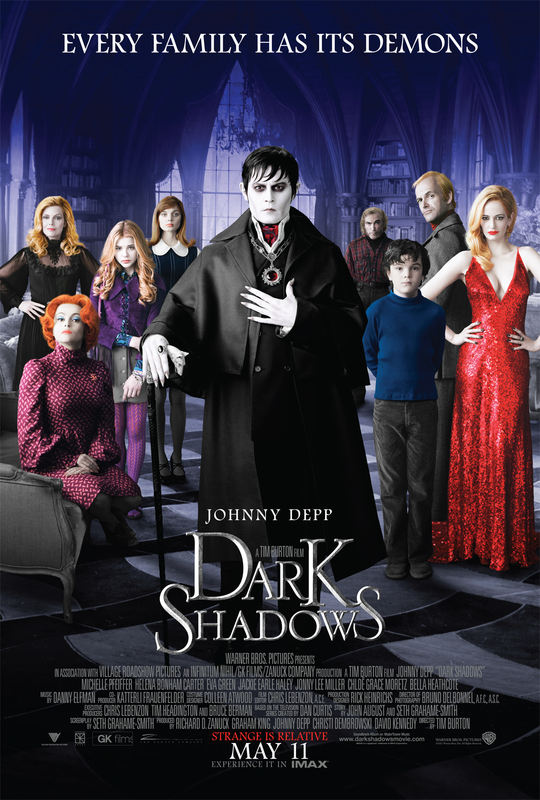 I enjoyed watching it as I wasn’t expecting a standard-setting, mind-blowing thought-provoking piece; Tim Burton, Helena Bonham Carter, and Johnny Depp have worked quite a number of times together and it seemed like Dark Shadows was one of those works they did and had fun with. And those three can pull it off. The Burton/Depp formula will never fail to impress me!